One of many American kestral nest boxes installed in a fruit crop system. Photo credit: Dr. Catherine Lindell. We study avian behavior and ecology and the roles of birds in ecological functions and ecosystem services. Particularly, we’re interested in how to better manage landscapes for species that contribute significant ecosystem services. 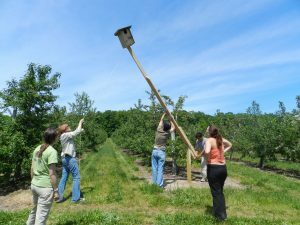 In North America, we measure whether resource subsidies (nest boxes) provided by fruit growers for a beneficial species (American kestrels, Falco sparverius) result in changes in feeding habits, reduce the number of crop pests and, in turn, increase fruit production. Pathways for pest management chosen by a grower are also considered, as they may be influenced by economic considerations, consumer preferences, and conservation issues. Challenges: Crop pest-management, decision-maker acceptance, economically viable alternative to chemical sprays, crop productivity. Promising Research: Biological controls, alternative pest-management, trophic influence in predators. As a boundary organization, GLISA integrates information from a wide array of scientific fields, helps develop collaborations among stakeholders and organizations with similar goals, and provides climate information to support decision makers throughout the eight Great Lakes states and the province of Ontario. GLISA plays a technical role in climate change adaptation projects across the Great Lakes region. Annually, GLISA awards external grants to organizations that will work with GLISA to address the risks of climate change and variability in the Great Lakes region. Challenges: Climate change, risk communication. Promising Research: Risk assessment and planning tools, education materials and methods, ready-to-use data and presentations. 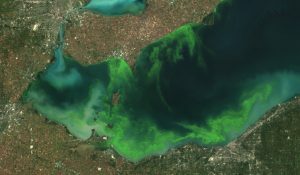 The basin of Lake Erie along the shores of Toledo, Ohio have notorious onsets of harmful algal blooms (HABs). Our team investigates the links between increased phosphorous and nitrogen and their sources to the increase or decrease in HABs. Further, our research has shown a link between phytoplankton blooms and variation in the carbon dioxide flux out of Lake Erie. Using state-of-the-art technology, our research aims to understand and better manage HABs. Challenges: Unsafe drinking water, discovering causation, HABs. Promising Research: Links between phytoplankton blooms and carbon dioxide. Land surface conditions, especially soil moisture, play an important role in regulating the energy and water fluxes between the land surface and the atmosphere. Irrigation practices that are happening in many agricultural regions can change the land surface properties and alter regional hydrological cycles. However, irrigation practices are not currently represented in global predictions, which can lead to errors in surface states and fluxes, which in turn can lead to errors in weather and climate predictions beyond the irrigated areas. Promising Research: Remote sensing irrigation dataset and schemes, global climate model, including human factors in prediction models.